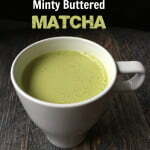 Enjoy a hot cup of minty butter matcha as a pick you up in the morning. Healthy fats and matcha green tea make for a healthy breakfast choice. Blend on high for a few seconds until it's foamy.